Home » Traffic Ticket & Car Accident Data » Do Work Zone Speeding Tickets Affect Work Zone Accidents? Do Work Zone Speeding Tickets Affect Work Zone Accidents? Earlier this year, the New York State Department of Transportation announced a new safety campaign aimed at reducing work zone accidents. The PSA was triggered by continuous increases in traffic accidents taking place in roadway construction zones. The new campaign comes after new data shows that both work zone accidents and work zone speeding tickets edged downward last year. The begs the question of whether speeding tickets reduce work zone accidents. 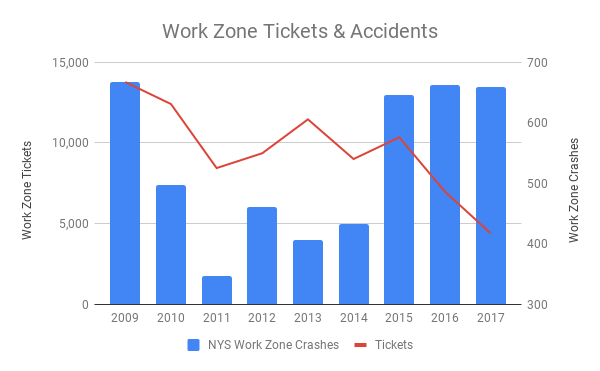 Data from the Department of Motor Vehicles shows that NY work zone speeding tickets and work zone accidents have a tenuous relationship. In 2009, police throughout the state wrote 13,784 tickets to drivers for excess speed in marked construction zones. By 2011, that figure gradually declined by nearly 40% to just 8,446. During the same time period, work zone accidents declined from 667 in 2009 to just 347 in 2011—a 48% decrease. However, in subsequent years, work zone speeding tickets increased by 36% through 2013, while work zone accidents rose only 16%. Accidents spiked again in 2015, jumping up 59% to 646, while tickets declined by 10% to 10,356. In 2016 and 2017, accidents remained generally flat, but tickets dropped drastically, with only 4,404 issued last year. Unfortunately, speed is not always the primary cause of work zone accidents. More than 57,000 accidents—or 18.43%–listed driver distraction as a contributing factor. Unsafe speed was only a factor in about half as many accidents; 28,112 (9.09%) were attributed in part or in whole to speeding. This makes it the fifth-most common factor in accidents, behind tailgating and failing to yield right of way. It would be a stretch to say that work zone speeding tickets are misguided and ineffective, however. After all, when it comes to lethal crashes, unsafe speed is the most common factor by a large margin. In 2017, 267 fatal accidents involved a speeding driver. That is 71% more lethal than the next most fatal factor, passing and lane changing and 85% more lethal than driver inattention/distraction. Where Are Drivers Getting the Most NY Work Zone Speeding Tickets? Unlike many other types of tickets, the list of counties that hand out the most work zone speeding tickets has little relationship to the size of the population of the county. Erie County, with the eighth-largest population (925,528) handed out the most work zone speeding tickets in 2017 with 755. It is followed by Broome County (population 193,639), in which 512 work zone speeding tickets were issued, and Orange County (population 382,226), which wrote 277. Throughout New York State, work zone speeding tickets comprised just 0.6% of all speeding tickets in 2017. But many counties tagged a far greater percentage of speeders while they were in work zones. For example, 4.8% of all speeding tickets in Clinton County went to speeders in construction zones. In Broome County, a similar proportion of speeding tickets—4.2%–were for speeding in a work zone. Work zone accidents are terrible things and no one intends for one to occur. While unsafe speeds are not the primary cause of traffic accidents in New York State, accidents where speed are a factor do have the highest rate of injury and death. Thankfully, work zone accidents and work zone speeding tickets are down overall throughout the state, which could imply that drivers are generally hitting the brakes more often and paying closer attention when entering marked construction zones. It’s interesting to note that work zone speeding has declined at a much greater rate than overall NYS speeding tickets. In fact, the total number of speeding tickets issued in 2017 was slightly higher than in 2016, although it remains part of a long-running decline. Interested in other traffic ticket and traffic accident trends in New York State? Then check out our data analysis pages.